UNCASVILLE, Conn. — Fedor Emelianenko addressed questions about God and the UFC with Breitbart Sports but he tapped out on a discussion of Vladimir Putin. The UFC dubbed Fedor’s handlers difficult and his demands unreasonable after several failed attempts to land the mixed-martial artist many deem the best ever. The fighter holds a very different view of the organization paying him to serve as an ambassador for the brand in retirement. Emelianenko fought four times under Coker’s Strikeforce promotion. Three of the Russian’s four career losses occurred there—to Fabricio Werdum, Antonio “Big Foot” Silva, and Dan Henderson—before he rebounded with three consecutive victories to close out his career. 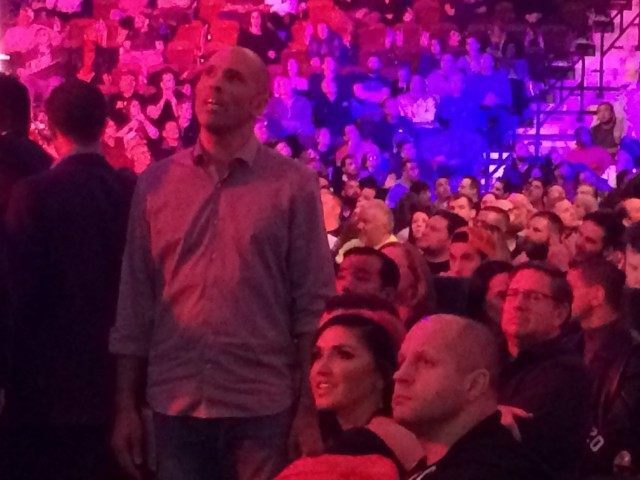 Despite his association with Coker corresponding with the only real fallow stretch of his career, Fedor clearly looks upon the promoter, who now runs Viacom’s Bellator MMA, with fondness. The fledgling political leader looked upon Breitbart Sports’s question about Vladimir Putin with decidedly less enthusiasm. Emelianenko won election to a provincial duma in 2010 as a member of the ruling United Russia Party and Putin subsequently named the national hero, whom he has watched ringside, to Russia’s Council of Physical Fitness & Sports. Whether from a desire to avoid mixing sport and politics, commenting on domestic matters in a foreign country, prolonging an already long afternoon, or becoming this man should his words get lost in translation, Fedor gave the question about explaining Putin’s popularity in Russia to an American audience a great, big nyet. Emelianenko did not speak but his silence said something. Part of Emelianenko’s popularity in his homeland stems from his soft-spoken devotion to Christ. Where other mixed-martial artists might sport a tattoo or two (or two hundred), the inkless Fedor wore a wooden cross into the cage and ring. Like other fighters, Fedor traveled with an entourage. But it included a bearded Russian Orthodox priest. Rather than join the Red Devil Sport Club, he prevailed upon them to alternatively call themselves the “Saint Alexander Nevsky Club,” named in honor of the medieval Russian patriot, or the “Imperial Team.” He talked God rather than trash. His faith helped him as a fighter, he avowed, but it helps him more broadly as a man. As it turns out, you can teach an old dog new tricks. Former UFC heavyweight champion Frank Mir snapped a four-fight losing streak on Sunday, knocking out Antonio Silva less than two minutes into the UFC Fight Night main event in Porto Alegre, Brazil. The official time of the stoppage was the 1:40 mark. Fighting for the first time in one year, Mir (17-9), traditionally a southpaw, came out in an orthodox stance. The unexpected switch might have thrown Silva for a loop, as he threw just three total strikes in the fight. Mir, 35, credited the switch to his new Las Vegas-based boxing coach, Angelo Reyes. He said he took nearly one year off to heal from injuries -- and re-learn how to box from a new stance. "I came out looking for the jab," Mir said. "I knew he hits hard. There was no doubt about that. He has a long right hand. I wrestle left side forward and my head coach said, 'Switch back to orthodox.' So, I did. That's why I took extra time off. I learned how to box the correct way. The jab sets up everything. I've never had a dominant jab." The victory marks the 13th finish of Mir's career, but only his fourth knockout. It is his 15th win inside the Octagon -- the most ever in the UFC's heavyweight division. The jab was undoubtedly effective for Mir, as he set up both of his early combinations with it. A short flurry caught Silva against the fence in the opening moments of the fight. After a feeling-out process between the two after that, Mir landed the left hook that dropped the big Brazilian. Referee Mario Yamasaki gave Silva (18-7-1) every opportunity to recover. Mir stepped over his opponent and rained down punches with both hands. He then switched to a series of elbows, which knocked Silva out cold. It is the sixth knockout loss of Silva's career and third in his last four fights. Mir earns his first victory a comeback submission victory against Antonio Rodrigo Nogueira in December 2011. According to immediate cageside stats by Fightmetric, Mir landed a total of 10 strikes in the fight. Silva, who missed time late last year to undergo surgery to remove a tumor near the base of his brain, landed one. President Barack Obama announced recently that the United States would restore full diplomatic relations with Cuba. The U.S. will open an embassy in Havana for the first time in more than 50 years and negotiations are ongoing about lifting the 54-year-old trade embargo. The news came as a surprise to many, including UFC fighters and Cuba natives Hector Lombard and Yoel Romero. Both men defected from Cuba to further their MMA careers and are excited about the possibility of U.S. relations with their home country being mended. "It's great news for all the Cuban families and everybody that is Cuban," Romero told MMA Fighting through a translator. "People from Cuba have a lot of hurt in their heart. Many of their family members have died crossing the Caribbean. It's very dangerous. I wouldn't want to wish it on anybody. Little kids crossing the Caribbean in canoes, they make up floats out of air mattresses. It's incredible. The people in Cuba are really hurt. This is really great news and could bring a lot of happiness to families living in Cuba. They could come here like regular people and not have to worry." Romero, a former Olympic silver medalist for the Cuban wrestling team, defected to Germany in 2007. Lombard was an Olympic judoka for Cuba and defected to Australia in 2004. Both men still have family members in the country and hope for a better life for them. "One of the reasons I didn't want to go back is it's painful," Lombard told MMA Fighting. "It's painful to see so much poverty. And me being OK, I wouldn't forgive myself. A lot of people are OK with it. They go over there and show up, show off and drive a nice car, have a lot of stuff, jewelry. I wouldn't feel happy with myself to go over there and show off in front of people and be OK with it. One of the reasons why I never went, there's so much poverty I wouldn't feel happy with myself. You feel guilty. I went through it and it's no fun." Trade opening up between the U.S. and Cuba would certainly help the Cuban economy. And the ability for Cubans to emigrate freely would also be beneficial -- especially for athletes. Romero and Lombard both believe there could be an influx of Cuban fighters in the UFC if that happens. There is a surplus of excellent athletes in the country, they said. "If they are allowed to leave Cuba and come to the U.S., I think it'll be a great opportunity for a lot of athletes," Romero said. "It'll have to be their choice, but if they do make the choice, it would be a great opportunity for them. I don't know much about baseball, but in MMA there are better gyms here and better coaching. There's more room to grow in the sport. In Cuba, they are more limited and it is more difficult and different." Both Romero and Lombard said they would look into the possibility of bringing family members over to the U.S., if those relatives so choose. Both of them enjoy their lives in Miami, a Cuban hotbed. Lombard does not paint a nice portrait of what life is like in Cuba. "Imagine waking up in the morning and not having anything to eat, nothing to wear," Lombard said. "That's tough. "I hope it helps the Cuban people. They've had a tough time for so many years. Trust me, it's no fun to live there, honestly." Round 1: Big John McCarthy makes his return to Nevada, and he's the third man for this middleweight bout. They touch them up. Southpaw stance for Romero. Body kick from Kennedy, just a feel out. He back-pedals and resets. Romero tris a kick and Kennedy catches his foot, twists him to the fence. Kennedy with a high kick. Left hand from Romero lands, and Kennedy circles. Now another one, and that one hurt more. Kennedy is bleeding from nose. Romero hunching forward, and looking to further that advantage. Big body shot sends Kennedy rolling back, but Kennedy still plunging ahead cautiously looking for an opening. Punch to the thigh. Now a big leg kick from Romero. Straight left hits home from Romero. It's all Romero right now, big strikes that are landing. Now Kennedy, on cue, shoots for a takedown, gets it, then Romero gets up and takes Kennedy down! Now they get right back up; great example of the type of wrestling on display in this fight. Scrambles are going to be interesting. Blood gushing from Kennedy's face; he seems not to be picking up the speed by Romero. The Cuban rushes in and tackles Kennedy violently at the middle of the cage, but Kennedy once again able to get back up. Kennedy looks to land a knee, but doesn't deploy. Now Kennedy lunges forward with a combo, but nothing much got through flush. MMA Fighting scores R1 for Romero, 10-9. Round 3: Romero took an extra 30 seconds between rounds, and McCarthy had to throw the stool out. Romero lands a huge shot and Kennedy goes flailing! Now Romero, who was dead on his feet, comes to life! He is landing huge shots on Kennedy, one after another. Kennedy in real trouble here. Romero on top, and Kennedy bleeding profusely. A couple of more shots from Romero and it's over! McCarthy steps in. It was a pushkick and then a left hand that started the trouble. Then Romero came in and just blasted Kennedy with shot after shot. After taking some of those on the ground, he rolled over in a bloody heap, and McCarthy had seen enough. Wow. Artista marcial cubano a Salón de la Fama de EE.UU. UFC middleweight Cung Le sets a Guinness World Record for the most eggs crushed in one minute with a kick. UFC on Fox 11's main card kicked off with a highly anticipated bout between fast-rising middleweights Yoel Romero and Brad Tavares. Romero entered the night with an impressive three-fight knockout streak while Tavares was riding high after winning five fights in a row. When the two faced off, Romero absolutely mauled Tavares with powerful, physical wrestling. Romero took Tavares down at will, ragdolling him with powerful takedowns and cracking him repeatedly with huge punches and elbows. I'll probably look back on this and laugh in a few weeks. I feel this way right now, though. Yoel Romero has what it takes to win a belt. That isn't to say that Romero would necessarily beat Chris Weidman. But between his Herculean wrestling, raw punching power and legitimate athleticism, there isn't anybody that would really be immune to Romero's home invasion-like fighting style. The Cuban lacks the cardio right now, and he is still very raw, but he has the tools. He just needs to sharpen them a bit. There's no real way around this. Tavares is a grinder who just found himself out-wrestled in every conceivable way. He was out-struck, out-clinched and out-muscled. Tavares is 26 years old and had an impressive 7-1 UFC record entering the night. With a five-fight winning streak, he was on the verge of forcing his way into the title picture. But Romero completely tossed that notion to the wind. The Hawaiian has obvious skills and is young enough to make plenty of runs at the belt. Right now, though? It isn't his time. Romero vs. Tavares made sense. Now, though, it's time to determine whether or not Romero is actually a title contender or just a sort of middleweight Gleison Tibau. There are plenty of potential opponents for Romero. Tim Kennedy, Ronaldo "Jacare" Souza and the winner of Luke Rockhold vs. Tim Boetsch all make sense. Seriously, while I criticize the UFC a lot for how it sets up cards, it has given Romero the opportunities and exposure to succeed with the spotlight on him, and it has paid dividends. Right now, Romero is a star. He isn't the most accomplished fighter by any means, but he is somebody fans want to see and somebody that the UFC can use to break into a new market, specifically Cuba. It will be interesting to see where the UFC will end up putting him next. Hector Lombard dio la presentación de su carrera este sábado al vencer a Jake Shields en una muy dominante decisión que seguramente lo catapultará hasta el top 5 de la división welter. Hector Lombard llegó a la UFC con la promesa de ser un asesino, alguien que causaría un enorme impacto en la división de los pesos medios. Por lastima esto nunca paso, pero un cambio de división lo ha llevado a ese nivel. Este sábado en el evento UFC 171 el Cubano logró dominar por completo al eterno veterano Jake Shields en una pelea que seguramente lo catapultará al top 5 de la división. Hector comenzó a destruir a Shields poco a poco en el primer round, conectando monstruosos golpes sin mencionar una patada a la cabeza que le abrió una cortada al antiguo campeón de Strikeforce. Las cosas se pusieron un poco más lentas en el segundo round, pero aun así Lombard sacó lo mejor del asalto y se mostró muy inteligente al no hacer nada tonto en la guardia de Shields. Lombard continuo dominando el tercer round, salvo por un intento de guillotina por parte de Shields en los últimos segundos del asalto. Con la victoria Hector elevó su récord a un 34-4-1 y gana su segunda pelea desde haber tomado la decisión de bajar a la división welter.